After a 90 minute drive northwest of Toronto, you'll be in the truly beautiful area of the Georgian Triangle and Muskoka. Cottage rentals here are the main economy of the area. Because of this, you'll be very well taken care of. The Georgian Triangle and Muskoka are great for outdoor activities and is home to the Bruce Trail, Canada's longest footpath. If you're into hiking, try it out! But if you're into beaches, you can also enjoy over 14 kilometers of Wasaga Beach's white sands. Don't go to the Caribbean when you can get it all and more right here in the Georgian Triangle and Muskoka. 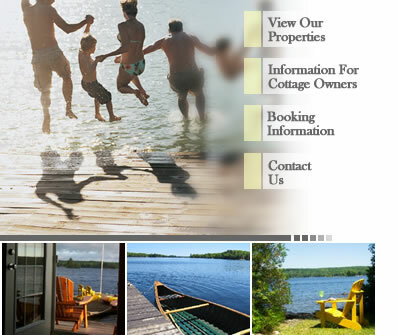 Cottage rentals in the area are listed below so click the links to find the perfect vacation accomodation for your next trip. Clear waterfront, 18`off the end of the dock - NEW DOCK IN 2013! Although the cottage has water views, we are directly behind the one on the water, with deeded access to 5 private Sandy beaches directly across the road on the cul-de-sac. Water is shallow and good for swimming. Deeper at the end of the dock. Sandy/pebbly/rock shoreline on hardpan bottom. Gradual wade-in access. Surf builds with on shore breezes.